Neutrons play a dominant role in the stellar nucleosynthesis of heavy elements and the quest for accurate experimental determinations of neutron-induced reaction cross sections becomes more stringent with the refinement of nuclear and astrophysical models. 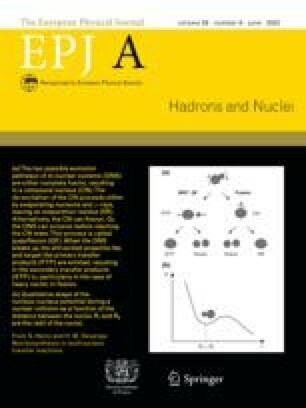 We review here an experimental nuclear-astrophysics program using a high-intensity neutron source based on the 7Li(p, n)7Be reaction with a Liquid-Lithium Target (LiLiT) at the Soreq Applied Research Accelerator Facility (SARAF) Phase I. The quasi-Maxwellian neutron spectrum with effective thermal energy \( kT \approx 30\) keV, characteristic of the thick-target 7Li(p, n) yield at proton energy \( E_p \approx 1.92\) MeV close to its neutron threshold, is well suited for laboratory measurements of neutron capture reactions along the astrophysical s -process path. The high-intensity proton beam (in the mA range) of SARAF and the high power (few kW) dissipation of LiLiT result in the most intense source of neutrons available today at stellar-like energies. The principle, design and properties of the LiLiT device and recent measurements of Maxwellian Averaged Cross Sections (MACS) based on activation of targets of astrophysical interest are described. Decay counting or atom counting methods (accelerator mass spectrometry, atom-trap trace analysis) are used for the detection of short-lived or long-lived activation products, respectively. In a different realm of applications, the 7Li(p, n) reaction is a leading candidate as an accelerator-based neutron source for Boron Neutron Capture Therapy (BNCT). The high neutron yield achievable from a liquid-lithium target, its sustainability of operation under kW-power incident beams and the recent availability of small-size high-intensity accelerators are compatible with a hospital-based clinical facility. An effort towards the characterization and realization of a liquid-lithium target for BNCT is reviewed. Perspectives of pending and future developments towards SARAF Phase II, based on a 40MeV, 5mA CW proton/deuteron superconducting linear accelerator, are summarized.